This is my method for 6 channel reauthoring. I will say, first, that it is very similar to the reauthor thread that is already stickied here, so my focus will be on the 6 channel mix in audacity. Step 1: Follow the instructions for DVD Decryptor that are in the other thread. Basically, I only leave checkmarks next to the 6 channel audio and the Video, I don’t mess with subtitles. I right click and choose Demux for all. This will create an AC3 file and an M2V file. I save them to a directory on the desktop so I can have quick access to them. This is the AC3 file that we will be editing with Audacity. Remember this order when mixing. Otherwise your saved file will sound wrong. More on this when we get to “Mixing”. The first thing I do is create a “moviesync” file. This file will only contain the Rifftrax audio. However, it will be exactly the same length as the movie audio. When this file is created, you can simply drop it into the Auacity, and it will be perfectly synced to the other Channels. This isn’t a tricky process, but it seems a little confusing. However, I’ve tried doing it other ways, and this works better than any method I’ve tried. You will want to highlight the entire waveform for the center channel. You do this by left clicking on the name of the channel in the box above the “Mute” button for the channel. There is a screenshot below. Remove or edit the intro of the Rifftrax MP3 so that it is short enough to fit before the first line of the actual Rifftrax. The first line is usually, “And we’re back” and I actually usually remove this line to give me that second or two for the intro. How you choose to do this is up to you, but be sure that the intro is short enough to fit before the jokes start. Some people may choose to remove everything before “And we’re back” for simplicity’s sake. Now, your Rifftrax waveform should be shorter than the movie’s center channel waveform. Use the Time Shift Tool (it looks like a line with arrows pointing left and right) to move the Rifftrax waveform back and forth in relation to the center channel waveform. Use the Readme that came with your Rifftrax to find out where the first Disembaudio line is. Use the Time Shift Tool to line up Disembaudio’s dialogue with the movie’s dialogue. It can be a little tricky to find the first Dis line, but once you do, you’re almost done. 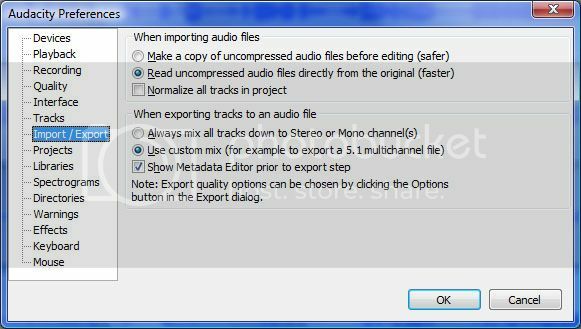 Highlight the entire Center Channel Waveform and use the Silence Tool. This will completely silence the original center channel audio. Highlight the entire Rifftrax waveform, then press [shift] and highlight the entire silenced waveform. Both need to be completely highlighted. Choose Mix and Render from the “Tracks” menu. This will combine the two tracks, and the result will be that your Rifftrax waveform is exactly the same length as the movie’s waveform files. Save your new moviesync file. I usually save in AC3. I usually name it “Moviesync.AC3” and put it in the same folder as the original soundtrack audio. When it is saved, you can just close this session of Audacity. Everything else will be done in the session with the original soundtrack waveforms. Drag your new moviesync AC3 into the Audacity, it will appear below the 6 channels of the Original Audio. Highlight the entire moviesync waveform, and copy it, then paste two more copies at the bottom of the project. You will now have three identical moviesync waveforms at the bottom of the project. Okay, you now have 9 waveforms in your project. It will be six again when we’re all through, so don’t panic. The first thing we’re going to do is set the volumes for all of the tracks. 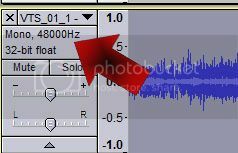 - You see that picture that I inserted above that shows where to click to highlight the entire waveform? - Right below the name of the track are the mute and solo buttons, and below those buttons are a volume slider and a balance slider. - Below those sliders is an upward pointing triangle. This collapses the waveform to save space. We will set the volumes for each track with that top slider. Just slide it to the left to turn down the volume. The only waveform that will not be turned down is the center channel. Below are the amounts that we will turn down the channels. If it says -6db, it means “push the volume slider to the left until it says ‘-6db’”. You can mute and collapse the waveforms that you aren’t working on. I do, to save space and better see what I’m doing. Track 7: (Rifftrax Center) Usually -7db. You will have to figure this one out. Read below. Track 8: (Rifftrax Front Left) Usually -17db. It is whatever you set track 7 at, minus 10db. I’ll explain. Track 9: (Rifftrax Front Right) Usually -17db. It is whatever you set track 7 at, minus 10db. I’ll explain. Okay, here’s what you need to do. Mute all of the tracks except for Track 3 and Track 7. Check to make sure your moviesync is correct and that the Rifftrax is synced correctly. If you’ve followed the instructions to this point, it will be. Now, listen to the Rifftrax. It is naturally a lot louder than the center channel, usually about 7db. Just find a dialogue heavy section without a lot of music or loud noise and make sure the Rifftrax is about the same volume as the dialogue. Now, you set the volumes of the other two Rifftrax moviesyncs at 10db less than you set Track 7. These will be mixed with the left and right channels. It creates a nice effect, because the Rifftrax isn’t only coming from the center channel. But I’m getting ahead of myself. 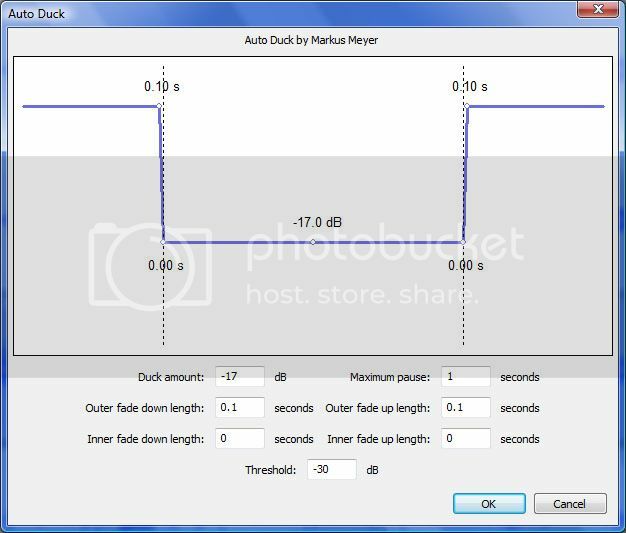 So, the good news is that you only have to Autoduck one track: The center channel. Just left click on the name of Rifftrax Center track (the same place you click to highlight the entire track) and hold it. Drag it upward until it is directly under the Center Channel Track. You may need to have all of the other tracks collapsed. Otherwise dragging it up can be tricky. Here are my ducking settings. They work quite well for me. With Autoducking complete, we now will mix the three channels that require mixing. At this point, the two center channel tracks are in positions 3 and 4. Highlight them both using the shift click method we used for mixing the Moviesync earlier. Finally do the same process with the Right Front Channel and the remaining Rifftrax channel (usually set at -17db). Be sure to move it to position 2. Now you have 6 channels again. The top three channels are named “Mix” and must be in the correct order. Make sure that none of the waveforms are muted. Muted channels will be silent on the final DVD. Before we save, make sure your Project Rate at the bottom left of the Audacity screen is set at 48000. If everything looks good exit the settings menu. I save the file as AC3 to the same directory we have been using from the beginning. I usually name the file “Dolby.AC3”. Call it whatever you like. Click on the File Menu and choose Import Chapter (There is a chapter information text file in the folder where the other files are located. Set your Destination folder for a different folder than the one we are using. We don’t want to get the files mixed up. Set the name and location of the image file. Put it in a folder on the desktop where it is easy to find. Okay, you now have a Rifftrax Reauthored DVD. You can burn it on a DVD Rom, or you can mount it on a virtual drive and convert it to an MP4. It’s all yours. And it should sound great. Well, that's it. Please let me know if any of this is confusing. Any suggestions or questions are welcome. Cool. Thanks for the guide. My first go round is very promising. Awesome! Going to start with Fellowship of the Ring. Thanks so much for this! I had this idea. What I'm gonna do is, take the (-10db) rifftrax for the left and right front channels and alter them further. For the left channel I'm going to mute Bill's riffs, and for the right channel I'm going to mute Kevin's riffs. I'll leave the center channel rifftrax alone. I figure the effect will be that it will sound like Kevin is more prominent on the left, and Bill, the right. I realize this will be incredibly time consuming and might not even be that noticeable. Or it could be totally badass. Actually, at one point, I was going to put each riffer into their own channel on one of my riffs. I started, but soon got bored. I'm lazy that way. the GOT Season 3 Episode 9 riff mp3 is stereo, how does that work with 6 channel audio?